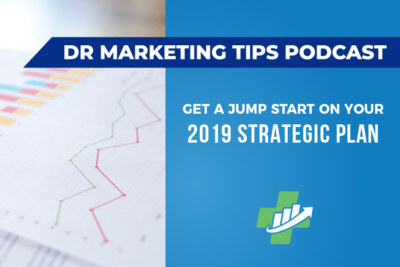 Want to know our best advice for your marketing strategy in 2019? Use video (with captions) whenever you’re considering posting on social media. There is no better way to maximize your ROI, boost your search ranking, and attract prospective patients. Captions increase view time by 12% (and it’s something your competition isn’t doing). As one of our ENT clients learned from a valued hearing loss patient, captions for video are now akin to having wheelchair access to public buildings. A no-brainer. 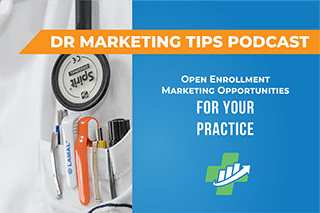 What does that mean for your medical marketing in 2019? Join us as we share why video is the way of the future for your marketing strategy, how you can create free fantastic videos yourself in just minutes, and boost your views, engagements, and shares through the roof without spending a dime on advertising. Speaker 1: Welcome to the Dr Marketing Tips Podcast. Your prescription to the answers you seek to grow your medical practice easier, better, and faster. 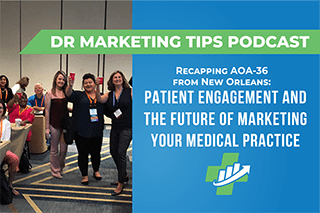 This show is all about connecting practice administrators and medical marketing professionals with peers, working in practices, learning from experiences, making mistakes and sharing successes. Let’s get started. Jennifer: Hey there. 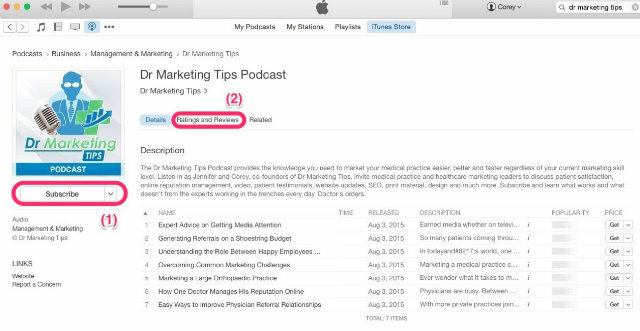 Welcome to The Dr Marketing Tips Podcast, I am Jennifer. Jennifer: We are here today to talk to you about something that we have found to be extremely useful when it comes to video marketing and our overall video strategy. So without further ado, Corey, why don’t you explain to our listeners what it is we’ve been dabbling in and the kind of successes that we’re seeing and why it’s so important. Corey: Yeah. So what we’ve been doing is adding captions to every single video that we produce. 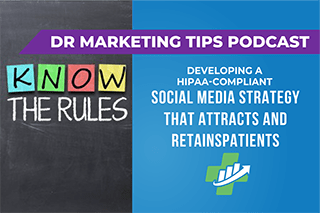 So sometimes if you’re a longtime listener, you’ll know that we’re big fans of video and what we’ll do is we’ll ask doctors for some getting to know you type videos, almost talking through their bios. We’ll do patient testimonials, we’ll do common procedures. And what we’ve started to do is add captions to each and every one of these. And the reason for that is simply because everyone’s kind of going in sort of a mobile first direction. So we know that a bunch of people watch video on Facebook, but there’s some new stats that just came out that said that 85% of these videos, when they’re watched on Facebook, they’re play without sound. Which means if someone’s scrolling through the timeline and you’ve worked long and hard on this piece of content for your physician, if there’s no captions, they might not have any idea what you’re saying. Jennifer: Yeah, you just kind of sparked something for me Corey. I was having a conversation yesterday with somebody about how our practices are so focused on having a mobile first website. And sometimes the practice forgets about, you don’t just need a mobile first website that is responsive and works on a phone or whatever device a potential user is using. But you actually need a mobile first marketing strategy. And this is one of those mobile first strategies is that having captions makes all the difference because of that 85% that you were just saying about. Corey: Yeah, absolutely, and I’ll say too that captions increase the view time by as much as 12 percent. So if you’re a marketer or even if you’re a practice manager, if you have to justify what you’re doing to the marketing committee or the board, this is a great way to make sure you’re getting the most return on investment and costs to hire that video crew to produce that video. And it was interesting. It was one of those light bulb moments. How could we not have paid attention to that? So for us it turned us into going out and finding some sort of solution to put captions on all their videos and we’re so heavy on video marketing that we had to go way back to add captions. And then we actually ended up putting this with all of our clients, so at this moving forward for about six months ago. We have captions on every video we do, but it was a hearing client or an ENT client. It was somebody that had hearing challenges and it was the whole audiology department that needed to have captions added to the videos. And we were not sensitive enough at that point, it just didn’t cross our path to think about it and it really changed our strategy moving forward and we’ve seen residual results as a result of that change. And so I think it’s just positive across the board. Corey: Yeah, absolutely. I would say that we’ve seen better retention, better engagement from the videos now. And that’s backed up by all kinds of stats, I was just looking at something from the Content Marketing institute. And it said that people are about 10 times more likely to share, comment, embed, engage with video content compared to other photos or blogs. And I would say we see that across the board. We are big fans of video, like you just said, even to the point of if we’re going to post, let’s say we’ve got an image of a physician. So we work with an orthopedic practice. They just had a new foot surgeon start. So rather than just kind of put up our headshot and say welcome, what we did was we created a small animated video that kind of walked you through where she went to school and now she’s now accepting patients at locations x, Y, and Z and we’re seeing a great return on that. So our advice would be even when you’re thinking about doing any sort of social posts, you’re going to want to include some type of video element if you can. Jennifer: Absolutely. And I was, so part of what I’m doing is going through strategically and looking at what we can do to freshen up the social communications across all clients. And that one example of the foot surgeon absolutely applies. In fact, as I’ve been looking at the planning for fourth quarter and first quarter of 2019, I’ve been looking at what can we do, what can we take that the traditional static just plain image and maybe we don’t produce 50 new pieces of content for first quarter of 2019, maybe we only produced 20 pieces of fresh content and we recycle 30 pieces. And of those 20 pieces, we make them really good and we use video and so strategically speaking, as I’m looking for evergreen content we’re using now where we’re implementing those, getting to know your doctor, kind of fun little videos that we don’t need to spend time with the physicians to get. And we’ve actually started, you mentioned the orthopedic client, but we’ve got a large ophthalmology group that we’ve been working with and those videos have been running now and we dropped them every Friday. They’d been running for about six weeks and their volume in terms of engagement and comments and shares and likes is through the roof without any dollars even being put behind them because their audience happens to be a little bit older and they just love the videos and loved their doctors. So just a great way to get engagement up into offer your potential fan base and potential patients something new that nobody else out there is doing. And it’s all done through video and it doesn’t really cost anything. Corey: Yeah. I mean, if you just think about the way that advertising sort of works as a whole, the video thing really does make sense. If you put an ad in the paper, someone may flip by it. Maybe they see it for a second, but you know that they need to see it for way more than a second for it to make a difference. If you run an ad on TV you know that you’re going to capture them for let’s say 15 to 30 seconds with then know that much more likely to remember your brand. It’s kind of the same thing here. So if you put a social posts out and let’s say you’re doing some type of Facebook advertising, Instagram advertising, and you’re trying to increase like an ancillary services at your practice. If it’s just a static image, someone might scroll right by it just like a print ad, but if they have a video, they’re going to sit there for a little bit longer. Maybe they’re going to engage with it a little bit more, but just the fact that they’re looking at for a few more seconds means that, that much more likely to recall it later when they need it or want it. Jennifer: Absolutely. As a sidebar I’ve got some of our listeners know that I get active in politics here and there, not big politics, but I’m coming to the end of an eight year term as an elected official and I’m trying to … I know, I’m so excited to be coming to the ends of the best part, but I’m having to help somebody get to get elected to fill my shoes. And I’ve taken everything that we do from a marketing with medical practices and we’ve implemented that on the campaign trail because it’s a local race. And went out during the primaries and did nothing like our main focus was to get video testimonials from constituents out there in the community. And it did great. Those video testimonials, they become viral, they get scared, they get liked. People want to, people when they’re doing their research on which candidate they were gonna elect, they specifically went and watched her videos and all the numbers back it up. And in a five way race she got 35% of the vote. So it did something right because it got people talking, people sharing, people liking, and then at the end of the day she hit a goal and hopefully that will transition, and that will translate to a victory come November. Jennifer: So it works across industries. Talk about some tools Corey, let’s talk about some tools that people can use for getting those fun automated videos and then also talk about tools for getting quality captions. Corey: Yeah. Alright. So we know that everyone is watching a video, by 2019, 80% of all internet traffic is going to be video recording [inaudible 00:10:54]. That’s insane first of all, but second of all, how can you create video? So there’s a couple of resources and tools that we can share. One that we use is called wave.Video. It’s a very affordable service and it allows you to create short animated videos. Another one we use is called Biteable.com and so Biteable will allow you to create sort of fun, jumpy, happy videos similar to Wave, but they’re a little bit more production value involved, but everything is a for those two tools is sort of drag and drop. You don’t really need any sort of training or technical no how. It’s pretty simple when you say Jen? Jennifer: Yeah, its simple enough that I’ve been able to go in and edit videos that have been created rather than have somebody go in and make changes and if I can do it then the people listening can do it. Corey: We talked to you about how to create videos, so you can hire a crew and come in and pay the money and that’s absolutely worth it. But if you don’t want to do that, then if you have a newer phone or the iPhone 10 just came, go get yourself one of those. You can record 4k video at 60 frames per second, which is insane. Corey: Yeah. And they work very well in low light. They can record stereo sound. So what I’m saying is if you have a newer phone, you’ll be fine. So your production value obviously isn’t going to be the same as if you had a full crew kind of come in, but it’s perfectly okay to get a quick patient testimonial. You have 20 seconds to talk about your experience, have been sign release for certain things supper compliant, and then use that as your content to put on your social networks. Jennifer: Hey Corey, if somebody is using their phone to do the video, should take a horizontal or vertical? Corey: You’re gonna want to go vertical because most video, like we said, it’s going to be consumed on Facebook via mobile. There’s actually so more than 500,000,000 people watch videos on Facebook every single day. So that’s a ton of you’ve seen them, there’s cute animals, funny pranks, recipes, whatever. But that’s how we record our videos. So they fit right in line with those type of videos. Jennifer: What about if you are pushing on Instagram, is there anything different there? Corey: You would also want to maintain a vertical there because Instagram … Facebook, you can let her box so it’ll show up kind of different. But on Instagram it’ll show up real funky. So you want to make sure that you’re vertical. Jennifer: We don’t want no funky video. Jennifer: So what are some of the other tools, captions? Corey: Yeah, let’s talk about captions. We use a service called Rev and Rev is awesome because … not kind of rev. Corey: They’re a transcription and captioning service. They’ll transcribe or put captions on really any piece of audio or video that you send them there. They are 99% accurate guaranteed, and it only costs a dollar a minute, which is insane. So essentially what you do, you’ve got let’s say two minutes of a patient testimonial or a physician answering a common question that he or she hears. You can submit that or post your two bucks, comes back in a caption in a file and you just upload that right into Facebook. There’s actually a guide with a video of me doing this on the insightmg.com website, so you can go check that out and kind of I’ll walk you through the steps. But Super Simple, you just upload the file, Facebook reads it, and then you press publish. Super easy and it really, really works well. Jennifer: I Love Rev, but I will say if you are too cheap to a dollar per minute, then you can always do the free version on Facebook, but I will tell you that the free version on Facebook probably has about 40% accuracy, maybe 50%. So you have to go in there and it’s a little bit of a pain because it goes frame by frame and you have to make adjustments. Rev is a game changer, but there’s always a free option if a dollar a minute is too expensive for you. Corey: And if dollar a minute is also too expensive, we actually have a coupon code if you go to our website because we use Rev a ton. So they gave us this offer for our listeners, you can get a $10 rebate. So essentially your first 10 minutes are free. So if you want to go try it and do a couple of videos, then no charge to you from our friends at Rev. Jennifer: I love it. I love it, so Rev, Rev, videos, captions. You better be doing video if you’re doing marketing, you don’t need to use professional. You can use a phone make sure to check out Wave and Biteable. I think those are big game changers and if 85% of the people are watching videos, then I think that 85% of your social media should be a video at least as a threshold. Corey: Yeah, that’s a good ratio. I would agree with that especially now. Jennifer: And again, you can’t just have a digital plan for your website. You need a mobile … can’t just have a mobile plan for your website. You need a mobile plan for all of your marketing. That’s how this world has changed and that’s how marketing has changed and that’s what you’re gonna be paying attention to in 2019. Corey: Absolutely. So with that said, I’m Corey. 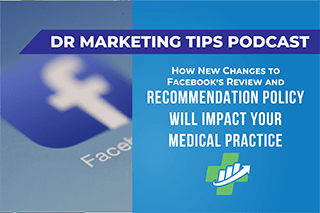 Jennifer: I’m Jennifer and we’ll see you next time on The Dr Marketing Tips Podcast. Speaker 2: Thanks for listening to the DrMarketingTips.com podcast. 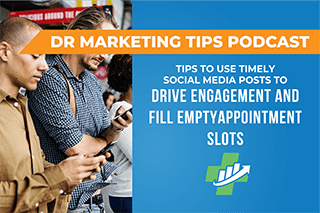 If there’s anything from today’s show you want to learn more about, check out Drmarketingtips.com for our podcast resource center with all the notes, links and goodies we mentioned during the show. If you’re not already a subscriber to our show, please consider pressing the subscribe button on your podcast player so you never miss one of our future episodes, and if you haven’t given us a rating or review yet on iTunes, please find a spare minute and help us reach and educate even more of our medical practice peers. Thanks again for listening and we’ll catch you next time. Doctor’s orders.